Digital Innovation in Financial Services is a comprehensive legal assessment of FinTech or digital financial innovation covering its potential applications to payments, securities clearing and settlement, crowd-funding, and central banking. It is the first systematic attempt at proposing a conceptual framework against which to consider the most advisable regulatory policy approach vis-à-vis this incipient phenomenon. Consumer behaviour is rapidly trending towards the use of digital devices as instruments through which to transact day-to-day business. This timely book shows how the global digitisation trend and the steadily rising consumer demand for innovation in the field of financial services create new opportunities not only for retail consumers but also for financial service providers, regulators, and central banks. The author offers a comprehensive overview of these opportunities and their countervailing legal and regulatory challenges. The aim of this book is to bring some clarity on a number of much-used but not always well-understood concepts, to distinguish between the fanciful and the more realistic applications of digital innovations in the financial services field, and to shed light on their legal and regulatory implications, less by way of an academic exercise and more by way of a practical endeavour, taking into account the current financial markets’ regulatory architecture, and how this is likely to be impacted by the eventual proliferation and use of digital innovations for the delivery of financial services. The book also clarifies the legal and other barriers to be overcome – including cybersecurity and risks to privacy – before any widespread adoption of digital innovation in the highly regulated financial sector context can occur. 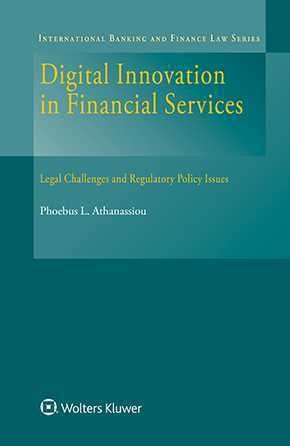 As an informed assessment of the legal merits and risks of technological innovation for financial service providers and central banks, and as a contribution to establishing a conceptual framework within which to analyse and better understand the applications of digital innovation to the financial sector, this practical work is bound to be welcomed by legal practitioners and legal scholars alike with an interest in financial services. Policymakers and regulators will also appreciate its guidance on how to temper the less benevolent aspects of FinTech with targeted, risk-focused regulation, so as to promote innovation and preserve the potential benefits for financial markets and their participants alike. Epilogue: Financial Services in the Twenty-First Century – What Future for DLTs, Blockchain and Virtual Currencies?